Born in Footscray, 15 August 1911 to parents Frederick Nash and May Isabel Nash (Stone), Arthur was a fitter by trade and was living in Blyth Street, Altona when he married local lady Dulcie Ellen Burt in 1936 at the Altona Baptist Church in Sargood Street. Arthur and Dulcie raised their two children in the family home at 25 Railway Street, on the corner of Bayview Street. Sadly their 25 year old son (Arthur William) passed away in 1967; their daughter Joan Brown still lives happily in Altona. Dulcie Ellen Burt (15/11/1916-7/12/2009) was the daughter of the pioneer Burt family (Andrew Patrick Burt and Edith May Burt (Birrell) living in Upton Street and who Burt Street, Altona was named after. 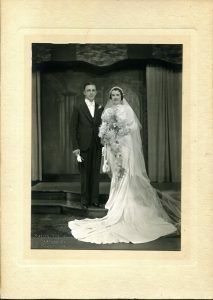 We wish to acknowledge the wonderful generosity of Joan Brown for donating many wonderful objects from her parents to the historical society’s collection, including the very elegant wedding gown worn by her mother in 1936. Former race cyclist and winner of 111 races from 609 starts, Arthur Nash certainly compiled a record of success and top class performances. His cycling record gains a further boost by adding to it 60 second and 41 third placings, and finally 120 fastest times. Arthur started his cycling career with the Altona Amateur Cycling Club in 1930; his first race being on a circuit which followed through Queen and Nellie Streets [Civic Parade], with the finish in Pier Street. Success came early to Arthur as in 1930 he was the first member of the club to win in open company as in June of that year he won a 20 mile handicap for amateur cyclists at Campbellfield – there were 125 entrants for that event. 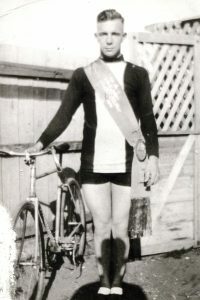 Prior to the Altona club disbanding in 1934, Arthur added numerous club events to his record as he was the unpaced road champion in 1931, 1932 and 1933, and the paced road champion over the same period. He was also track champion of the club in those years. After the cessation of his old club, Arthur joined the Newport Cycling Club and raced with them until 1940. The Newport club had as one of its members Alex Yuille, an Australian and Victorian title holder, but Arthur was able to compete successfully and notch many wins over this classy cyclist. 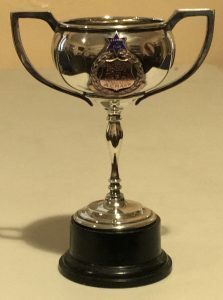 During the 1937 road racing season Arthur created a club record as he compiled a total of 10 fastest time awards in succession. With a time of 7 hours 50.5 minutes to his credit, Arthur finished in ninth place in the only Warrnambool to Melbourne amateur cycling race ever held. In this event which was held in 1938 Arthur rode from the eight minute mark and finished close to the place getters – his time for the event was the same as the winners and only three minutes outside of the fastest time for the race. As a long-distance rider Arthur was club champion in 1937, 1938 and 1939, and he also became unpaced road champion from 1937 to 1940. He was also successful in winning the paced road championships in 1938 and 1940, followed up by the track championships in the same seasons. When the Newport club went into recess in 1940 Arthur joined forces with the strong Footscray Cycling Club and in his first ride with them he won a double taking out the track handicap and the scratch race. Arthur did not take long to add to his list of major club wins as he became unpaced champion in 1941 and in doing so defeated two top riders in A Saunders and W Doggett, both Victorian road champions in their time. 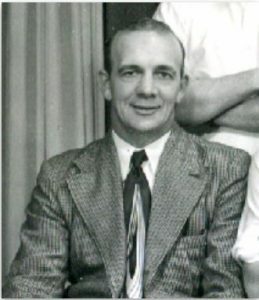 Before he retired in 1945 at the age of 34 Arthur was a member of the Footscray road premiership team in 1941 and 1945 and he was captain in the latter year. He was still riding off the scratch mark when he retired. Added to the open road race success of Arthur are a fastest time in the Melbourne to Kyneton in 1934 and a first and fastest time in Melbourne to Geelong and return event, also in 1934. And two years later in 1936 Arthur won a 50 mile handicap held by the Footscray club. Among his victories Arthur gained his best effort ever in a win over J Dowling who was Australian track champion at the time. Arthur defeated Dowling in a five mile scratch race held on New Year’s Day 1936, at the country town of Nyah. Cycling is not the only sport in which Arthur has excelled, for if we go back to his Footscray Technical School days, we find that Arthur represented his school as a high jumper in the combined school meetings held at Bendigo and Geelong. Cricket and football are two other sports of which Arthur has tried his hand as in 1929 he played football with the North Williamstown club and in later years 1945 to 1951 he was a member of the Altona Cricket Club first and second elevens. Arthur captained the second eleven for two seasons and in 1951 he was successful in winning the batting average, his best score ever was 88 runs. Bike riding still contains an interest for Arthur Nash as he uses this form of transport each day to his place of work, and no doubt the exercise from continued pedalling has maintained a fitness and a memory of past events. Archives – Altona Laverton Historical Society Inc.
Altona Star newspaper 5 Dec 1963 pg 6, Author Unknown.